Vincent Watts- My usual partner in Crime at Sonic Mix-did the mix and sound design for this feature documentary. It was directed by Jerry Rothwell for whom we carried out audio work on previous prize winning films ‘Heavy Load’ and ‘Deep Water’. The film has gone on to win prizes at the Washington Silverdocs and New York Tribeca film festivals and since had a decent theatrical run which is now coming to an end. To celebrate the end of the theatrical run there is a special screening and Q+A with Jerry and the producers at the Curzon Soho on Wednesday 3rd August at 6:20pm. DONOR TRAILER v4 WEBSITE from Docs & Pieces on Vimeo. 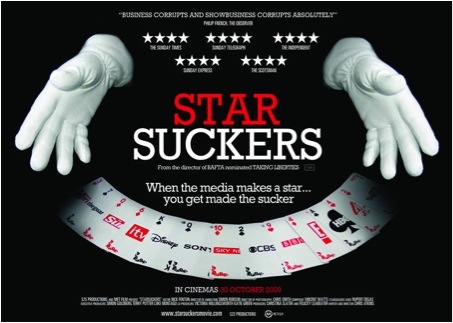 Starsuckers-(click for link to the Film Website) is a feature doc which looks at the corrosive effect of celebrity culture and the working practices of the celebrity press on mainstream news and politics. The audio post was carried out by yours truly and Vincent watts (Vincent also wrote the score). The film is getting a timely re-run on More4 starting 31st July 2011 at 11:10pm. Check it out if you get a chance. Should be an interesting watch in terms of what is happening with News International.